It’s that time of year, when…different strokes for different folks. Hopefully everyone falls in love like the song says, but if one has already fallen in love, like me, it’s that time of year when many things take place in our hectic lives. Here are twelve random things in our lives this Christmas season, cause random is how my brain works. One: In Leon’s world, Christmas lights are “Christmas time”. 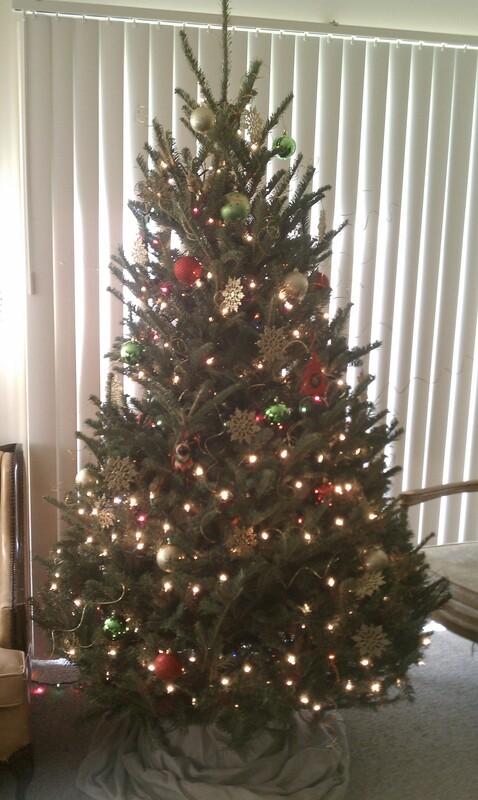 After Bonte’ and I put up the tree, and Leon awoke to it the next morning, he exclaimed “It’s Christmas Time!!! !” I was delighted he remembered. After all, he was not quite 2 last Christmas. But, then again, he is our child that at 18 months told me on the way to church on a rainy day that told me “the clouds were sad….they were crying”. I guess I shouldn’t be too surprised that he remembered, but it still made me feel all warm and fuzzy inside to see such wide eyed wonder at Christmas lights. I wish it was still that simple for us adults. 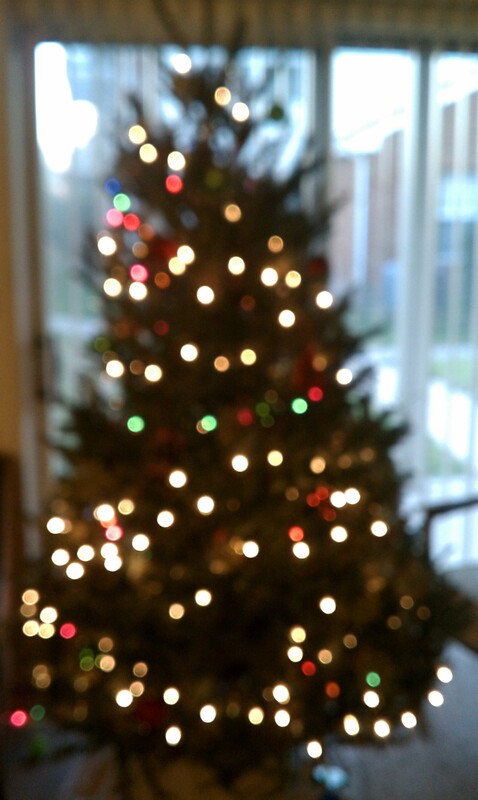 One spot on the tree is a tad bare in the lights department, he said, “there is no Christmas time right here”. Also, each and every day, he asks if it is time for Christmas, and wonders if we are going to Grandma and Grandpa’s yet. Our answer every day is “in a couple weeks”, which isn’t necessarily true, since each day it is one less than the day before. But, it is a sufficient answer for our almost 3. Two: Whether it feels like Christmas or not, Christmas is coming. This year has felt like ‘or not’ to me. Two days ago I was in shorts and capris, sweating to death on a walk. UGH! Oh well. During Christmas time for an almost 3 year old, many things suddenly relate to Christmas. I have overheard him telling friends that some very old, legless, headless battle guy was his ‘wary’ special present from Christmas. The usually older friend, stares sort of strangely at the toy in wonder that such a present could be in fact special, and from Christmas. Hmmmm….like I said before, different strokes for different folks. For leon, this is all part of getting in the Christmas spirit, tying everything back to Christmas. I am trying to do the same. Three: Though in my inner heart I would like to be Emily from The Jones Design Company, I am not. None the less I shall bake something to feel like Christmas is coming and in this case, for this year, dad’s favorite were our baking adventure recipe. 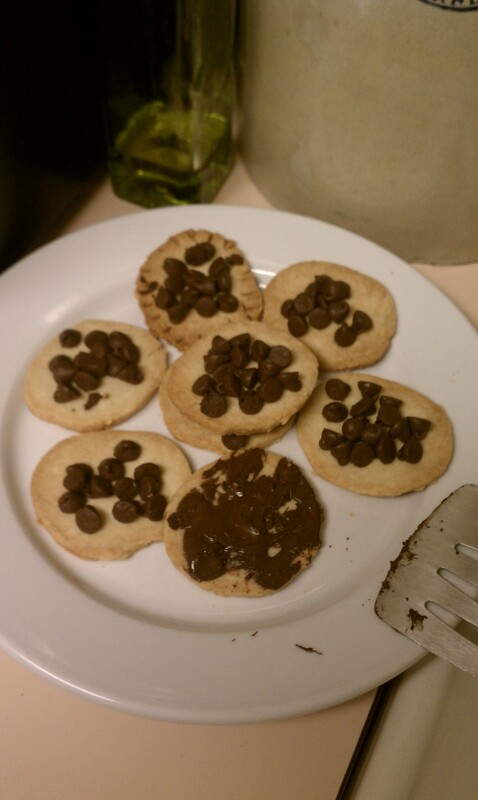 Butter cookies with Chocolate. 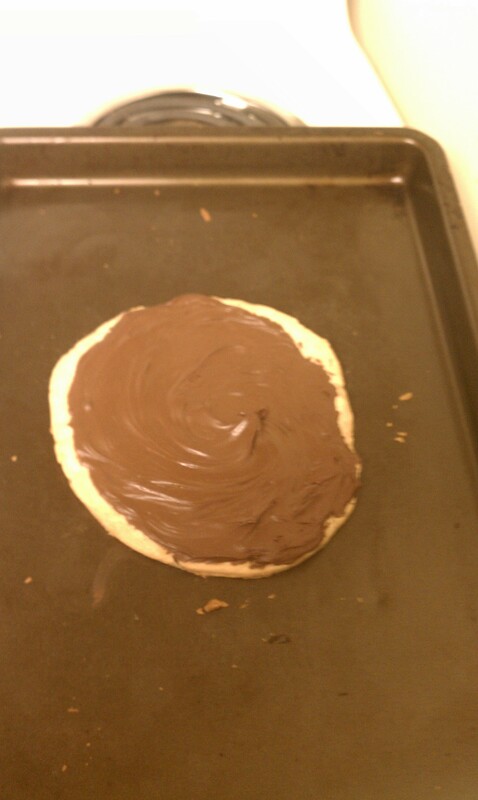 I wouldn’t say it was exactly a success, or a failure, but it was something that baked in our oven and was edible. 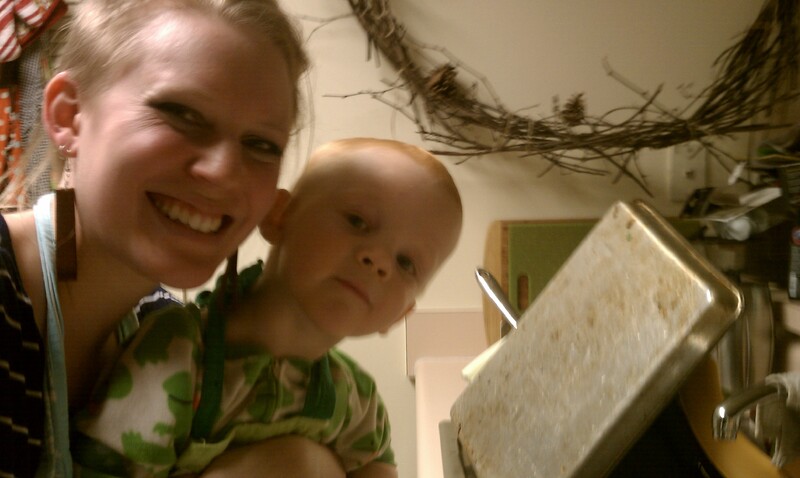 Leon and I had a baking party tonight complete with a living room dance party to Michael Buble’s Christmas album. Sol loves a good dance party too. Four: Solie is a trooper!!! He is finishing his 2nd round of antibiotic for his 2nd ear infection in 20 days. Poor baby. It’s been a month of intermittent sleep for both of us and a very miserable baby. This round of meds is really taking a toll on his tummy and on top of teething we are not sure he could have that much more going on. He is one sweet boy though, and though we know he isn’t himself, to everyone around him he is one happy-go-lucky-baby. He is our bub-a-rub and our Sol-bee. 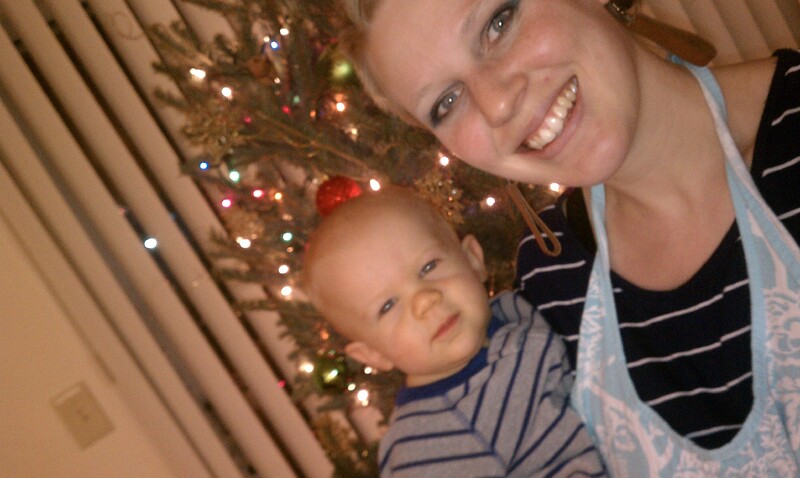 We are so thankful he made it though Whooping cough this year, and couldn’t imagine if he hadn’t. 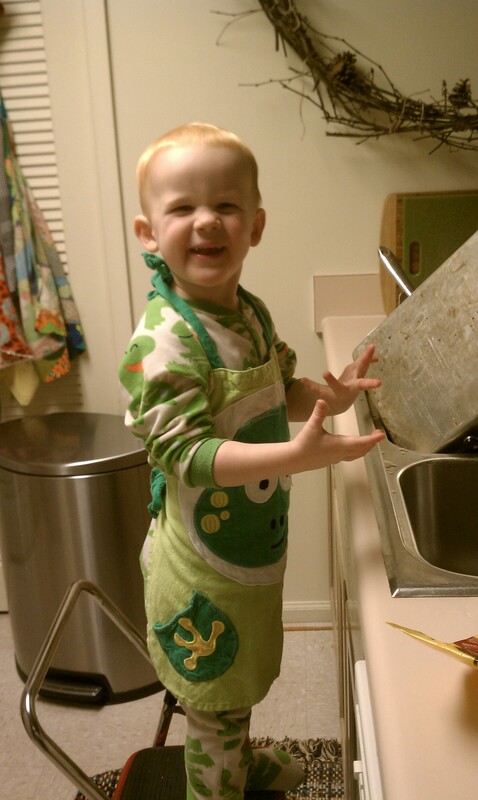 We love him to the moon and back, or in Leon’s version of the saying…”love him to toys”. (a much more valuable item to love someone to in his world). We are hoping for a healthy sleeping baby over our Christmas break! Five: Leon just got out of bed for the umpteenth time tonight, and while I would love to be seething with anger right now, since Sol goes into a crying fit each and every time he comes out of their shared room, I am holding back laughter. While nursing Sol back to sleep for the 3rd time tonight, Leon showed up in the hall, squinty eyed….”I fell out of bed, (pause) I fell out of bed this year, and got hurt rearry bad, on my belly”. Hmm….this year huh? His confusion of time and days, is hilarious. He often confuses minutes with hours, and wants to “eat chips or something for a couple more hours”. He often upon waking up, or I should say getting up from the so-called nap time, says…”I had a great nap mom. It was a short one, but it was rearry great.” In his most recent telling of his “great nap” he also added, “I was dreaming about batman, and bad guys….” Oh Leon, one thing we can’t say about him is that he is lacking words or imagination! Six: Six days until Christmas break…The land of finals is upon us. We can hardly believe it. Two down, three to go. I couldn’t be more proud of my man. He has weathered this first semester with triumph! I can tell, I am already letting down, which also makes me realize how much I have not been let down until now. Almost every day this week, I have not exercised, not made anything exciting for dinner, not really gotten ready for the day, and eaten way too many sweets. I am tired, and looking forward to Christmas break. If I am like this, and I am not the student, then he must really be ready for it. It is a relief to know we can do it, have done it, have made it though this chunk of school. The unknown has been conquered, and the satisfaction and comfort of looking back and seeing we are here now is, indescribable. Seven: Our parenting is paying off. Leon does hear the things we say, though at times it seems he is deaf to our words. We frequently are telling him the difference between men and women, their descriptors, and titles and such. While listening to a worship song in the car the other day, whose chorus repeats “Jesus you’re beautiful” time and time again, I heard Leon from the back seat, “mom?, they are saying Jesus is beautiful”. I responded emphatically, “he is and we love Him so much”. He then responded, “Jesus is not beautiful, he is not a girl, he does not have any dresses, he is not a princess!!!”. I was at a loss, he was right. Rather than try to explain the beauty of the Lord to a 3 year old, I told him he was correct and that Jesus was handsome. That will work for now. The hilarity of regurgitation and its settings. Eight: I can hardly wait for Christmas in New York with David’s family. I am praying for snow, snow, snow. Paul and Deanna will be home from Hawaii this year too, which will be the best. Nine: I am nesting. (and no I am not pregnant.) You know how I am when I get fixated on things. Right now, I am in this “making our house a home” craze. I am constantly, and I mean constantly, (what else is a law wife to do) looking for throw pillows, curtain and pillow material, lamps, blankets etc. to make this apartment feel like home. Though the funds to purchase such things are not exactly a reality, I none the less am having the time of my life looking and scheming ways to frugally make this happen. It fills my time at night whilst the hubs is studying and makes me just as happy as can be. The world of Pinterest is amazing I might add, simply amazing. Ten: I adore online shopping simply because I LOVE getting packages in the mail (even getting deodorant in the mail is fun). Eleven: People can’t be replaced. No matter how many wonderful new people we meet, and love, and build memories with, your heart still aches for those left behind you. So much was about to take place last time this year. Lately, I miss the boys. Nothing quite like a blazing fire in our beautiful little house by a lit Christmas tree playing scrabble with Esamy and Bub. Or, which was more common, making dinner for my house full of men, on a cold and snowy night. I remember our small pre- Christmas, family Christmas last year. Esamy got a new brown leather Hebrew-Greek study Bible, Luke Got a Popeye dvd, and we got an amazing coffee grinder which is used daily and makes me smile. Sigh. How I miss those times, I really do. Twelve: I am grateful. It has not been an easy year, but it has been good. It’s been full of fears, and triumphs, full of many goodbyes, and some hellos. It’s been a year of losses, yet we have much to be thankful for. It’s been stretching, and daunting, and down right difficult at times, but we have come through clothed in grace, that fits us perfectly. It’s been sort of wonderful to have a different perspective on Christmas this year. A year not focused on presents, and things, but on a gift that leaves us speechless in spite of ourselves. A gift that is far to lofty for us, that is humbling to receive, a gift we know we can’t repay, from a giver that doesn’t expect you to do so. This gift leaves my eyes welled up with tears, as I contemplate just how blessed we are. Merry Christmas. Merry Christmas. Well, we are in the midst of the great land of finals currently. Eaoihkgh! On one hand, I can’t believe this semester is over. On the other hand, it’s a tad on the crazy side for the next two weeks. I am building up a huge breath for my sigh of relief after David’s last final. Then, off to NY for Christmas!!! Can’t wait. I pray there will be snow, O, I pray! It’s hard for me to believe that we have lived here 4 months only. It feels like an eternity. Each day I wake up hoping that I will feel more at home here, and a bit less “missing” of my old life. I think it will take time. I do love my new life, my new friends more each day. I have met some amazing people and am so thankful God put us here. Like the old saying goes though, ‘make new friends, keep the old, one is silver the other gold’. While I love the new, my heart aches for the old at times. I had a good cry for the first time the other night in a while while talking to David. Felt so good to process and soon enough, tears were falling. I think the thing I miss most is the feeling of being known. It takes time to get to know everything about people. I had the best thing happen the other day though, which fell under the “being known” category. A dear friend randomly sent me a beautiful pair of shoes in the mail. We share the same size and taste in shoe, and out-of-the-blue came this package for me. It couldn’t have come on a better day. I think that experience made me realize how much I miss that feeling of someone knowing you well. In due time I will have that feeling again here, in due time. I have been in a Bible study on the Song of Solomon that is ROCKING my world. Who knew what was laced in that book. It’s changing me. Provoked by the study, this last week I’ve been thinking about wanting to be where God is, now. I was thinking back to our move to Wally 6 something years ago. I didn’t really want to go then, but knew we must. Wally ended up being my most favorite of times in life thus far. Knowing God brought us here, it is apparent He is now here with us. He is not still in Wally, but here. I’m so wanting to be on God’s page. I don’t want to be slow in the process of turning a page. I want to get in the chapter of life we are in now and not waste loving this here season too late. I’ve been chewing on that thought of God being here with us. Emmanuel, it’s what his name means right? More than generally speaking though, He is HERE with me, in Virginia Beach. This is the chapter he is in. As you know, I am not one to hold back. If you saw me, you might think, “what does she mean by getting on the same page?”. I am fully living here now, surrounding myself with friends, and memories, and laughter. I am almost loving it here, but for sure loving who is here. It’s not the outward part of page hopping I am talking about. It’s the inward page turn, that I feel I have no control over. I just keep telling God, I want to be with you. He will help me I am sure. Until then, I will carry on, enjoying the now, with a bit of homesickness underneath the layers. I guess it’s good to miss. When you’ve given your heart and soul to life and it takes you elsewhere, how could you not miss? Hope you are having a Merriest of Christmas Seasons!! !